This woman has been working doubly hard these days. Thought of abandoning my post as it gets tougher by the day, but thinking about how others are having the hardest time of their life, I felt I don’t own any right to complain and just leave them hanging in the air. So as a result of countless sleepless nights writing, revising and briefing, some uninvited guests came out big and heck, they’re all over…my face. As much as circumstance would allow, I really make it a point to sleep at the most 7 hours a day, I just have to realistic as getting the coveted 8 is beyond possibility given all these tasks at hand. I’ve learned this kitchen remedy from my aunt; in fact, she used calamansi back then to cure her breakouts. But a lot of my reads suggests that lemon also has same potency, stronger in fact than calamansi. So all you have to do is to slice the lemon crosswise and add in a moderate amount of honey in a little bowl. 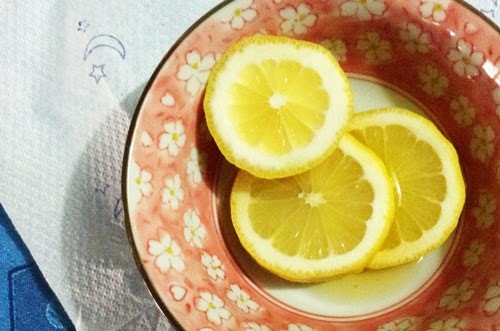 If you don’t like the lemon skin touching your cheek, you can squeeze in the lemon juice and use your finger to mix the lemon juice and the honey together, then dab the mixture to your puss. It might sting a bit - that’s because of the acid of the lemon but that’s exactly the sting that kills the bacteria, so just hang on and curse. The honey works as a natural moisturizer, so don’t miss that out. Do this at least minutes before taking a bath and maybe until the pimples are gone. The rest you can use to rub on your elbows, feet, especially your heels and oh, by the way lemons have the highest potency to skin whitening and take note, they’re super natural. So try it, it’ll just take a little of your time, it’s cheap and it’s the safest, just be sure to keep it off your eye.